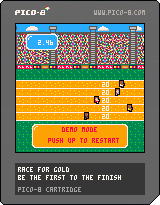 My PICO-8 old school button smasher is available to try! I’ll do a series of blogs on some of the aspects of the game including the High Score spinner. PICO-8 and GameMaker programmer and computer science nerd. Posts about game design, development and interesting ideas in coding and graphics. Copyright © 2019 Doc Robs …. All rights reserved.